Drawn lines—forming grids, plans and abstract patterns—are a powerful way of plotting the future, of imagining and communicating a form to be built, and a rational method of claiming, measuring and negotiating the dense forest that deﬁnes our west coast landscape. As we move through our day-to-day geography, we bear down upon this invention, as a system to understand time and space and the shifting conditions of our own particular orientation. 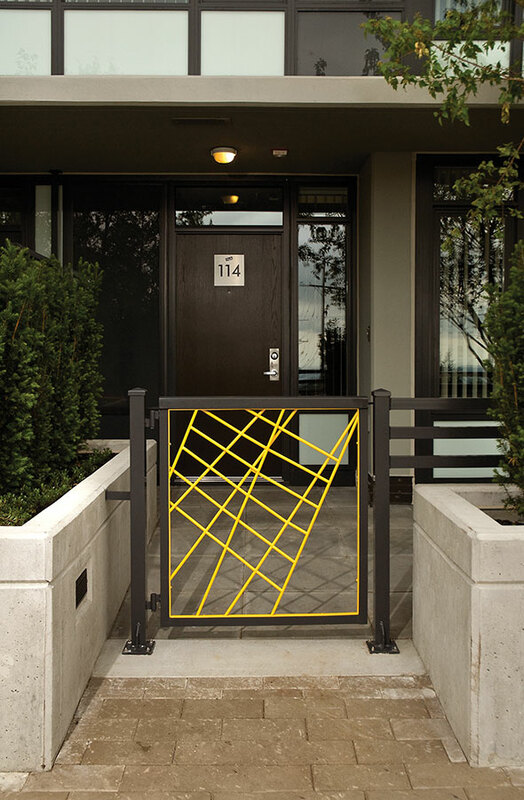 Yellow Fence draws upon this history of thinking about time and space as well as the materials and means by which boundaries are created, re-drawn and permeated in the complex use of the built environment by communities of people. Abstraction, and its relationship to the imaginary, is made concrete in the objects we dwell within and walk upon, for “within the abstract, there can be a lived experience of order.” In developing her artwork, Erica Stocking considered Arthur Erickson’s original response to the location for the future Simon Fraser University—focusing on the three design elements of site, light and cadence. Visiting the Hub@UniverCity site under construction, Stocking encountered security fencing that temporarily set the parameters of the work in progress. 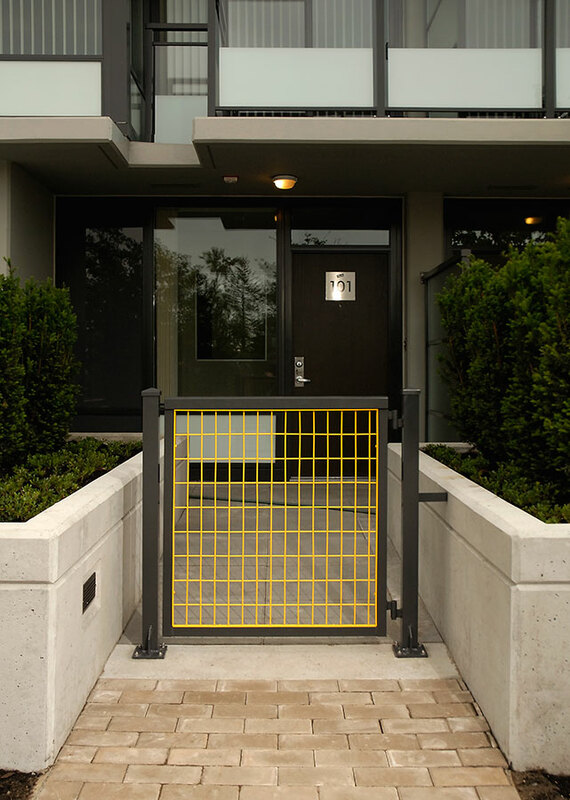 Formed in modular components, the grid fencing creates a stable structure within each panel, discourages physical trespass while allowing visual access, and adapts to the slope of the geography. They combine and recombine to trace the expansion and contraction of private and public admission to the property over time. 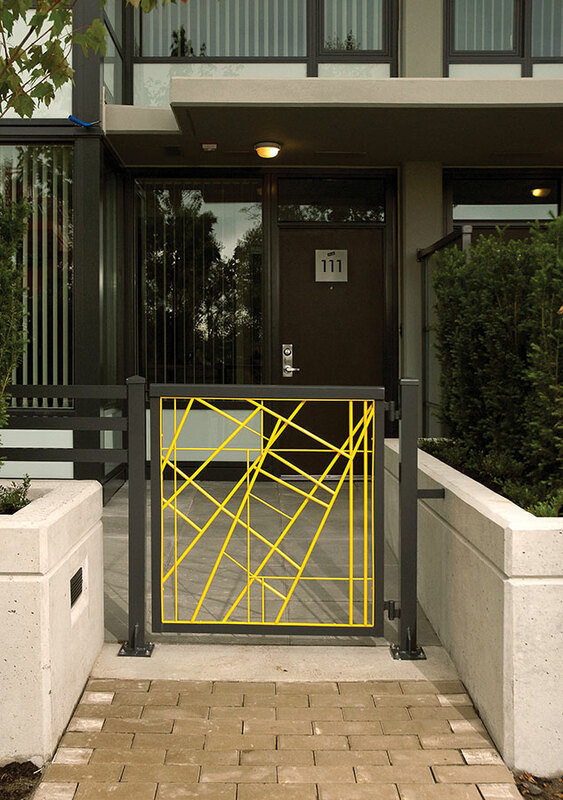 In Yellow Fence, this steel grid translates to a series of gates—moveable forms that hinge on stable horizontal and vertical axes, yet can swing into more complex and dynamic arrangements. Light, and its coastal variability, creates shifting conditions of vision on Burnaby Mountain, at times enveloped in low lying cloud, contrasting with the bright southerly exposure of fair days. 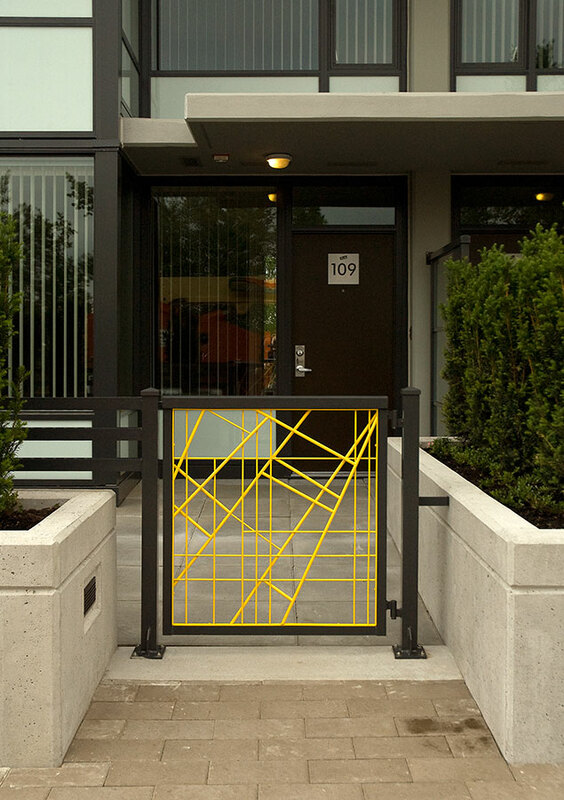 The bright ‘safety’ yellow echoes the temporary fence and carries a memory of its use in public signage and way-ﬁnding. It penetrates the gloom, captures attention, and marks the artwork as public. On clear days, sunlight interrupts the barrier gates, to form variable drawings through the shadows they cast. Cadence is the rhythm of the architecture and the environment, and the shifting perspectives of pedestrians moving through them. 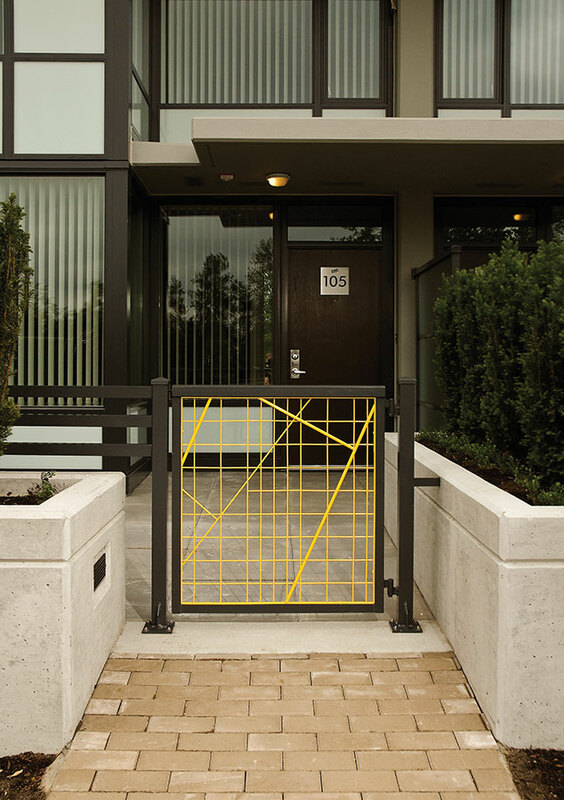 Between the homes and the shared space of the street, the gates are pivot points between different social conditions, arcing through the language of access and restriction, and the multiple forms of citizenship. 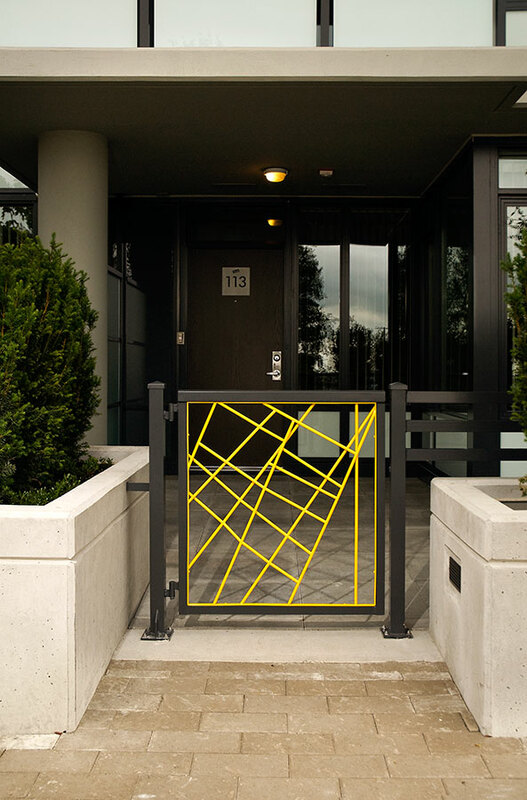 The routine grid is gradually disrupted over the series of gates, and their standard material reordered from a rational stability to unique and lively patterns. Yet, through the cast shadows, a trace of that perfect grid will appear, when the perspective of an alert viewer corresponds with the trajectory of sunlight and the opening angle of the ﬁnal, most easterly gate. Yellow Fence considers the mobile viewer and their encounter with declarative materials—exploring the potential of looking-in-motion to transform three-dimensional forms into the ﬂat plane of a picture and back again, accentuating the adaptability of our binocular vision. Stocking emphasizes, within this permanent artwork, the temporary and contingent nature of our perception, as aspects of the artwork appear and disappear, as conditions change and as we transit from place to place. Erica Stocking lives and works in Vancouver, where she received her BFA from Emily Carr University of Art and Design in 2004. Her work explores the public and private spheres in site-speciﬁc installations that have included the creation of a half-sized hotel room behind the wall of Lobby Gallery, located within a Vancouver hotel; a tableau displayed in the storefront window of Artspeak Gallery, and a bachelor apartment visible from inside and outside Gallery Two of the Richmond Art Gallery. As part of How Soon is Now, at the Vancouver Art Gallery, Stocking installed mannequins from a nearby shopping mall in the windows of the north façade, bedecked with garments from the gallery Lost and Found. Her conﬂation of interior and exterior spaces summon up dilemmas of voyeurism and exhibitionism and how these opposites commingle in contemporary consumer and digital culture. 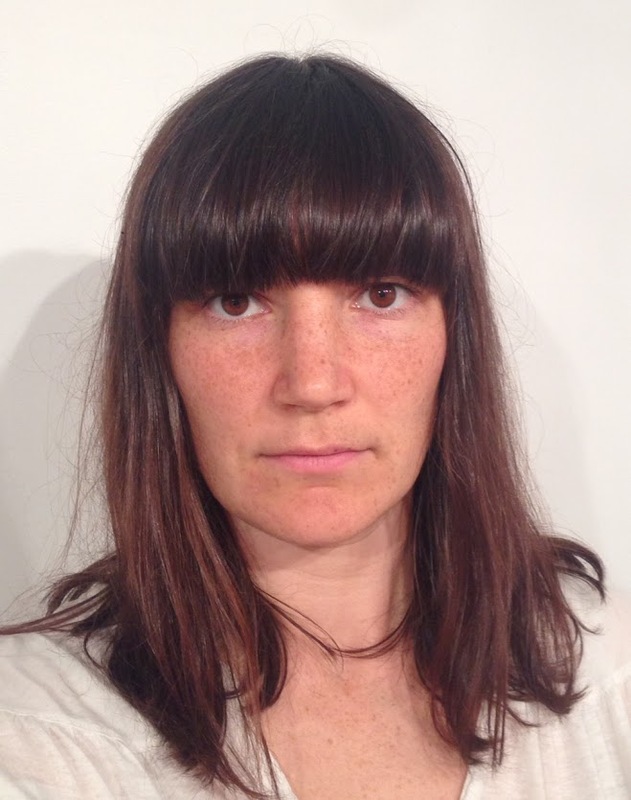 Stocking is a founding member of the performance collective Norma, whose work is drawn from concepts of group identity, popular culture and social behaviour. Norma’s projects have been presented by Artspeak; LIVE Biennial of Performance Art, grunt gallery, and Access Gallery.